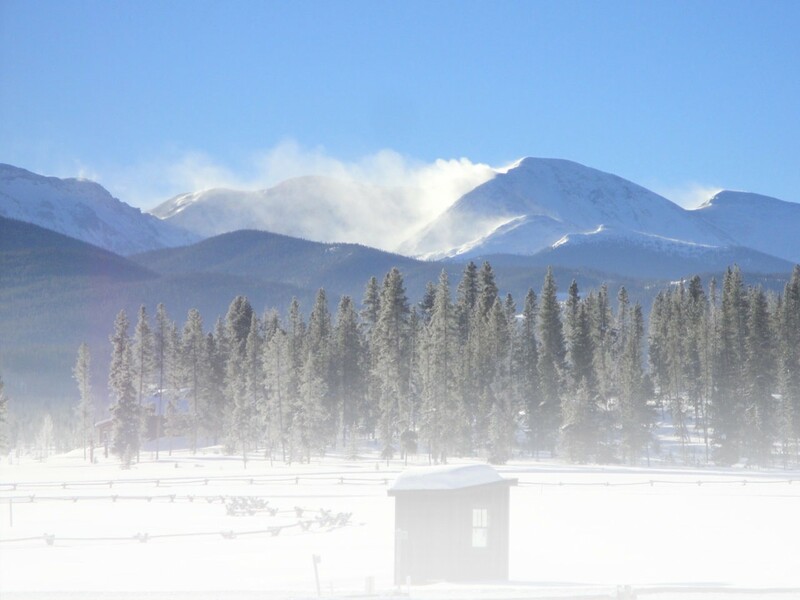 Situated on the Peninsula Recreation Area and offering sweeping views of Lake Dillon as well as back-country access to the White River National Forest, the Frisco Nordic Center is a wonderful winter amenity for Summit County residents and visitors. With 16 kilometers of un-groomed, snowshoe-specific trails, an average snowfall of 108 inches per year, and a former cross-country Olympian among its staff, the Frisco Nordic Center is a small nugget of gold in a major snow-loving locale. Therese and Gene Dayton have owned and operated the center for 46 years along with their three grown children, one of whom was a Nordic Combined competitor at the 2002 Olympics in Salt Lake City. They also operate the Breckenridge Nordic Center down the road which offers more terrain and guided tour opportunities. The hope is that someday there will be enough trails throughout the county to provide a thoroughfare between the two centers, much like the traditional Nordic trail systems of Scandinavia, a project that Gene has had a hand in helping to develop with the city. In other words, this family knows snow. Family snowshoe outing at Frisco Nordic Center. Although the Frisco Nordic center has slightly fewer services and amenities than its big brother down the road in Breckenridge, it makes up for it with beautiful, self-guided trails along the shores of 3,300 acre Lake Dillon Reservoir, wonderful wildlife viewing and greater seclusion thanks to its single track, wooded terrain and fewer crowds. Start with the flat and easy Green Mallard trail, one of Therese’s favorites, which takes you along the lake shore. Continue onto Bluebird towards Red Tail Hawk trail for a longer, more challenging trek that loops back to the lodge. A snack bar and rental center with high quality demo equipment from respected brands like Tubbs, Red Feather and Crescent Moon are available at the log cabin day lodge. Single, multi-day and season passes can be purchased for interchangeable use at either center. Additional access to the Gold Run Nordic Center at Breckenridge Golf Club may also be purchased for a total of 44 kilometers of snowshoe-specific trails ensuring a fresh view and new adventure each day. If boredom still manages to creep in despite the extensive terrain options, head across the street to the Frisco Adventure Park for an afternoon of snow tubing and sledding, or just kick back in an Adirondack chair with a cold one and enjoy the abundant sunshine and blue skies that Colorado is well-known for. In an effort to stay true to the family part of their family business, the Dayton’s try to cater to the youngsters as much as possible with kid-centric events like the Kids Fest in March with discounted equipment rentals, an igloo playhouse, free sledding and races and games for skiers and snowshoers complete with fun awards and prizes. Kids are also encouraged to participate in the annual Romp to Stomp charity event sponsored by Tubbs Snowshoes to benefit the Susan B. Komen breast cancer foundation. This year’s event will be held at the Frisco Nordic Center on Saturday, March 7. Snowshoe fun at the 2013 Romp to Stomp race. Although the Frisco Nordic Center doesn’t provide lodging, accommodation options abound in the town of Frisco and surrounding Summit County including chain hotels, bed and breakfasts, resorts and private vacation rentals of shapes and sizes. Most are located along the free shuttle route which includes stops at grocery stores, restaurants, shopping areas and all three Nordic centers for quick and convenient transport around town. A quick two-hour drive from Denver International Airport, Frisco has long been hailed by locals and tourists as a wonderful recreation area year round, especially for skiing and snowmobiling, and winter hikers are catching on to its cold weather appeal. With less high-end resort flounce and more of a rugged, local vibe, Frisco makes for a convenient, affordable snowshoeing playground. Pass Rates: $20 ages 18+, $15 ages 7-17, $5 ages 60+ and under 7. Multi-day and season passes also available. Equipment Rental: $18 ages 18+, $13 ages 7-17 and 60+, $8 under 7 years. Snowshoes and poles available. Pet Policy: Dogs on a leash permitted on all snowshoe trails at Frisco Nordic Center. Dogs permitted on a leash on designated trails only at Breckenridge Nordic Center. Visit frisconordic.com for more information. Return to the full list of Nordic Centers.